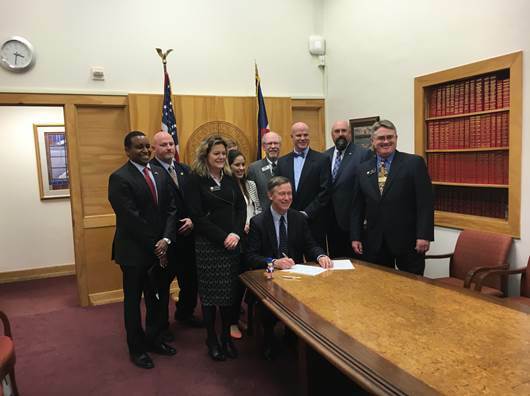 DENVER, CO (April 18, 2016) — On Friday, April 15, Colorado Governor John Hickenlooper held a ceremony as he signed SB 125: Credit Union Governance into law. The new law will give state chartered credit unions in Colorado the ability to compensate board members, as well as allow an audit committee to replace a supervisory committee. The new law goes into effect August 10, 2016. Pictured at the bill signing from left to right: Joe Neguse, Executive Director of DORA; Chris Kemm, VP of Political Affairs for the Mountain West Credit Union Association; Representative Tracy Kraft-Tharp, House bill sponsor; Patti Salazar, Commissioner of Financial Services; Governor Hickenlooper; Mike Litzau, EVP of Sooper CU; Todd Marksberry, President/CEO of Public Service Credit Union; Greg Mills, President CEO of Aventa Credit Union; and Senator Chris Holbert, Senate bill sponsor. The Mountain West Credit Union Association is the regional tri-state trade association representing 127 member credit unions, 3.3 million credit union members and $41 billion in assets throughout Arizona, Colorado and Wyoming. Not-for-profit in nature, credit unions provide low-cost financial services to their members. Founded in 2011, the Mountain West Credit Union Association serves and supports the interests of member credit unions through advocacy, community outreach, education and training, public affairs, regulatory and compliance services and strategic partnerships. The Mountain West Credit Union Association is affiliated with Credit Union National Association (CUNA), World Council of Credit Unions (WOCCU) and CUNA Mutual Group. Follow us on twitter at twitter.com/mwcua or on Facebook at facebook.com/mwcua. To learn more about credit unions visit AsmarterChoice.org.